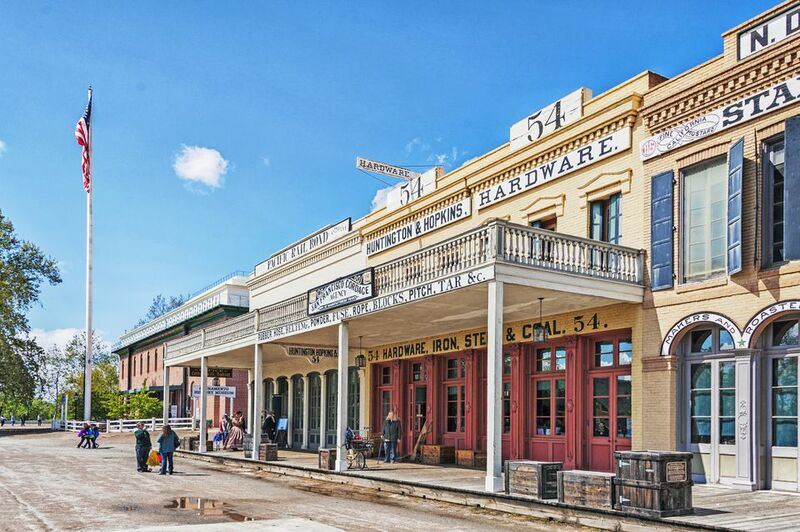 Old Town Sacramento is a place with a Wild West backstory full of gold rush miners, merchants, and madams. It looks like the Old West, too: Most of the area's 53 original buildings date from the mid-1800s. In some ways, though, it's more a theme-park-style concoction than a slice of real history. Visitors' opinions of Old Sacramento vary. Some people think it's cheesy, a tourist trap that's not amazingly fun and maybe going downhill. But more than three-fourths of people think it’s quaint and nostalgic and rate it good or excellent. Will you like it? That depends on your expectations. What you'll find in Old Town are lots of well-preserved buildings and ways to explore the city's rich history. Behind the nineteenth-century exteriors, you'll find places to shop and eat, which some people describe as "modern tourist traps in old buildings." If you're a history nerd, you'll love it. If you like places like Old Town San Diego and Old Town Pasadena, you'll probably like it too. If you're looking for a lot of exciting activity or a re-creation of history more like Colonial Williamsburg, you may be disappointed. In 1848, California pioneers Samuel Brannan and John Augustus Sutter, Jr. built a town where the American and Sacramento Rivers meet. That same year, gold was discovered at Sutter's Mill nearby. Prospectors soon arrived in droves on their way to the gold fields. The city now called Sacramento became California's state capitol in 1854. Over the next century, the commercial district moved away from the river to avoid floods. Soon, the old part of town became known as the worst skid row west of Chicago. Redevelopment began in the 1960s, and 28 acres of land in Old Sacramento became the first historic district in the western United States. Most of today's Old Town is part of the Old Sacramento State Historic Park, sitting on the bank of the Sacramento River. Historic buildings include the first building erected in California as a theater; the first home to the California Supreme Court; and the place where businessmen Collis Huntington, Mark Hopkins, Jr., Leland Stanford, and Charles Crocker started the Transcontinental Railroad. When you're in Old Town, check out some of these things to do. California State Railroad Museum: It's one of the state's best and most extensive railroad museums, with 21 restored locomotives and railroad cars, some dating back to 1862. They are organized to interpret the role of trains in connecting California to the rest of the United States. They also offer 45-minute train rides along the river. California Automobile Museum: Their collection features more than 100 antique vehicles. Every third Sunday, you can go for rides in their cars. Underground Tour: Sacramento had so many floods in its early days that they had to do something. Eventually, town planners decided to raise the streets by one story, leaving their original first floor underground. Today you explore those underground areas on this entertaining tour. Gold Fever Tour: The Sacramento History Museum takes visitors on an interactive tour that will introduce you to the real-life rascals who plotted and schemed to make the city the center of the Gold Rush. Riverboat Ride with Hornblower Cruises: For a relaxing ride and a different view of the city, take a daytime river cruise or an evening happy hour cocktail cruise. They also have many seasonal and holiday trips. Delta King Paddlewheeler: The old riverboat never leaves its dock, but you can have a meal in their restaurant or stay overnight in the hotel rooms. Their top deck is also a good place to watch the sunset over the Sacramento River. Shopping and Dining: You can find lots of places to eat and shop in Old Town. You can see a list of all them, along with a map at the Old Sacramento Waterfront website. If that's not enough, there's more detailed. You can find more things to do in Sacramento by using this guide. You'll find a list of public restrooms at the Old Sacramento website. Old Town is busiest in the middle of the day from Thursday through Sunday. If you go off hours, it might feel like a ghost town. Some visitors also say Old Town is also deserted at night. Parking lots are nearby, but sometimes you'll need a lot of patience. If there's a game at Raley Field or something else going on in town, traffic gets congested and finding a parking place becomes impossible. On those days, consider using ridesharing or taking public transit instead. Old Town is on the east bank of the Sacramento River between the Tower Bridge and the I Street Bridge. It's within walking distance of the Amtrak station, the California State Capitol, Raley Field, the Crocker Art Museum and the American River Parkway at Discovery Park. If you drive to Old Town, metered street parking is for two hours only and strictly enforced. To find other parking options, check the list at the Old Sacramento website. To get parking validation (with a minimum purchase) try these Old Town businesses.